World 3 in Yoshi's Island DS is set in a tropical beach area, which later becomes a desert cavern. The two bosses of World 3 are Bessie Bass and Priscilla the Peckish. The Yoshis meet Baby Wario in this world, who joins at the start of level 3-5 and accompanies them throughout the rest of the world. At the end of the world, Baby Wario leaves the party and joins a group of Bandits. 3-1: Up the Creek – This level is centered around using a raft to avoid a Lunge Fish, and progressing up a waterfall. 3-2: The Goonie Coast Isn't Clear! – Pirate Guys are found in this level, as well as Goonies which appear in the sky. Bloopers and Cheep-Chomps also debut in this level. 3-3: Island of Peril – This level mainly involves using pipes to advance through the level. The end of the level is identical to the beginning, though set at nighttime. 3-4: Bessie Bass's Battleship – This level takes place inside a very large pirate ship. Bessie Bass is the boss. 3-5: Heeeeeeere's Wario! – This cave level introduces Baby Wario. 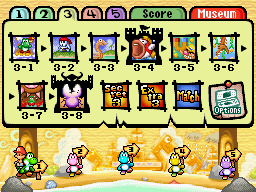 Yoshi needs to use Baby Wario's magnet to attract objects and advance through the level. 3-6: Use the Magnet to Get Rich Quick! – The majority of this level is contained within a jungle environment. Baby Wario is able to use his magnet to get Coins. 3-7: Tap-Tap's Sunken Cave – This level is taken place in a subterranean environment, featuring many Tap-Taps. 3-8: Castle of Priscilla the Peckish – This level takes place in a castle. The level features waterfalls which can push Yoshi downward, hindering his progress. The boss is Priscilla. This page was last edited on March 19, 2019, at 22:26.